The following list is based on what we took to the Pamirs in 2008. See packing bikes for airoplanes. 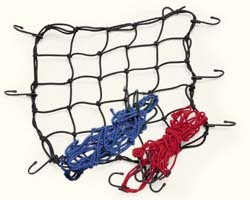 We now use motorcycle bungee nets to attach loose items to our racks. Theyre sold with 6 hooks, but only 4 hooks are used on a push bike: we should remove the middle ones on each side. So as to keep our baggage within the max 4 pieces, we put panniers and other luggage in 2 kitbags. Usually we leave them at a hotel, but if we will be making a lot of bus or taxi journeys we carry one with us to allow efficient packing. Stuffed in a pannier or bungeed on top; useful for walking around. for keeping clothes dry, and keeping those of different degrees of smelliness apart. Bolts holding pannier racks, toeclips etc. shake off all too willingly on rough roads. to patch up bad damage. 2 brake cables, 2 gear cables. 1 pair spare brake blocks. Old toothbrush for cleaning chain etc. We photocopy or tear out the pages of interest to us: we seldom take an entire guidebook. We took 2 books to the Pamirs (one of which was interminable). We carry loose papers in a set of plastic document folders. Were both digital now. Tracey carries her camera (a compact) in a padded bag in one of her bottle cages, allowing quick access on the road. Colin: a cordless VDO MC1.0+, which needs a couple of spare parts. Tracey: a Suumto wrist alti. A good 3-season bag is sufficient for almost any cycle tour  after all, you cant cycle on snow. A single Petzl LED headtorch which doubles as a spare light for cycling; one of our bike lights doubles as a spare torch. We have an MSR XG-K. The gubbins are the carrying bag, foil heat reflectors, cleaning kit and a couple of spare items. 2 pans are sufficient for our cooking. 2 plastic dishes, 2 plastic mugs. 2 plastic dessert spoons, one metal camping knife. Small containers for salt, sugar etc. Or rather a large one for sugar. You can never have enough sugar on tour. We usually take packets of French dried soup with us (better quality than we could buy at our destination), and whatever sort of teabag we least detest at the time . Dried porcini and good quality cocoa powder are valuable luxuries. Needed if insect bites are likely to be troublesome. For Peru Tracey also took a prescription bite-soother, having learnt that she reacts badly to the flies of the lowlands there. Also used for washing dishes. Tracey observes that a polythene bag weighs less and works just as well. cut back to ¾ length after too many encounters with chain rings. synthetic because less smelly after prolonged use. depending on which trousers I plan to cycle in. Thermal undies are worn inside the sleeping bag for extra warmth, and to keep the bag clean. to wear inside the sleeping bag.